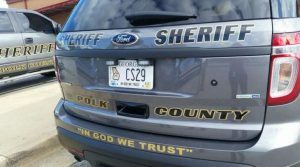 Polk County Sheriff’s Office leads the IN GOD WE TRUST movement! Sheriff Johnny Moats was the very first to display America’s National Motto on service vehicles! We want to say a HUGE thank you for leading the charge because now over 250 First Responders have followed in your bold and courageous action! Thank you for standing up for our country and National Motto!